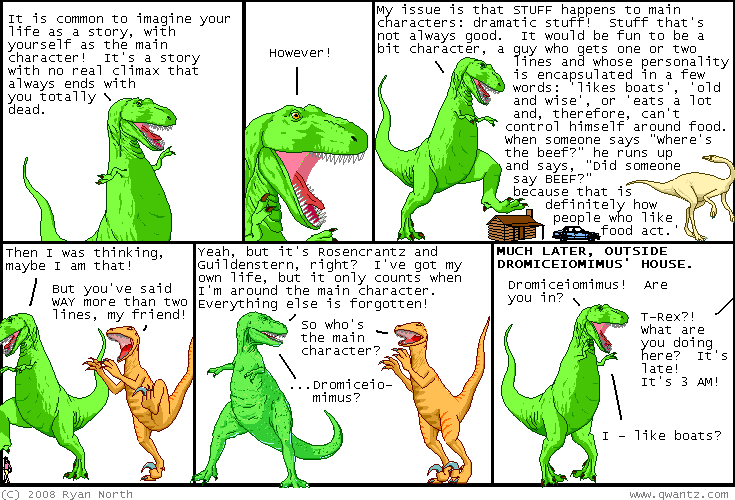 Dinosaur Comics - October 3rd, 2008 - awesome fun times! –Nobody must ever find out my AWESOME SECRET! When: Friday, October 3rd, 11 p.m.
Who are these Liederwölfe people, in press-release format? Liederwölfe is a group of professional musicians who bring vocal music from the past 731 years to any venue, from pubs to parking lots to palaces. In existence for nearly three years, Liederwölfe powers on in its mission: to get out of the concert hall and bring classical vocal music to intelligent and curious music-lovers on their own terms - pint in hand. From barroom opera-cabaret to live art installation to contemporary music festivals and community fundraisers, Liederwölfe has collaborated with such local artists as Sherwin Tjia, Chinese alt-rockers Shanghai Triad, visual artists Mathieu Lefevre and Belinda Campbell, burlesque artist Miss Sugarpuss, and folk-pop dreamcatcher Courtney Wing. One year ago today: my best mystery writing, ladies and gentlemen!